Michigan is clamping down on CBD infused products because the cannabis based oil is not an approved food additive. 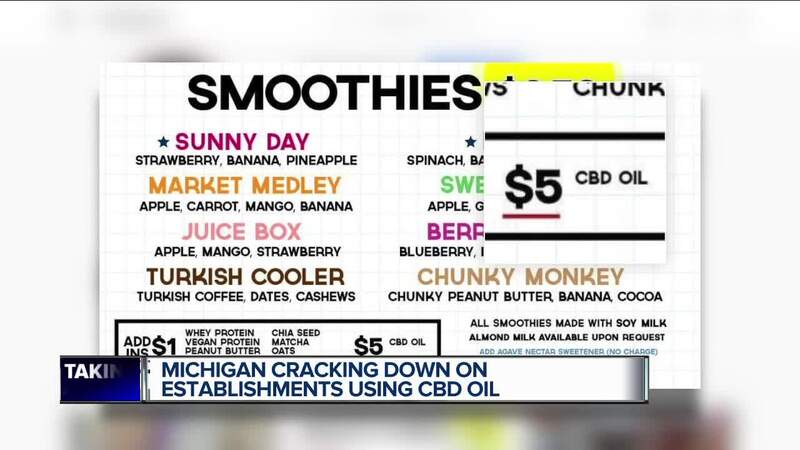 (WXYZ) — Yesterday, local eatery ChickP Detroit added 8 new smoothies to their expanding menu, along with the chance to upgrade each with one less than average additive: CBD oil, for an extra $5. CBD oil is popular for its therapeutic benefits without the same psychoactive effects as marijuana. But the menu offering was short lived, the restaurant telling 7 Action News that today after some publicity online, the Detroit health department came and told them to stop serving it, calling it a non approved food source. It comes just a week after another area establishment, Ale Mary’s Beer Hall in Royal Oak -- popular for serving cocktails with a CBD-infused soda -- was also told to remove it from the menu. Both establishments said it was their understanding that the use of oil was legal, after a 2018 farm bill notably legalized hemp cultivation and declassified hemp as a Schedule 1 controlled substance. But an Oakland county health spokesperson said it was still illegal to add to the food supply. And in a statement to 7 Action News, the Detroit health department said "CBD oil is not…an approved food additive by the Michigan Department of Agriculture and Rural Development (MDARD) or the Food and Drug Administration (FDA). Both the restaurant and the bar were fully compliant with the health departments and voluntarily pulled to offering from their menus but said they were interested in getting more clarification on the regulation.